A short circular walk from Stainforth visiting Catrigg Force, truly one of the most beautiful waterfalls in the Yorkshire Dales. After an enjoyable walk in the morning in upper Ribblesdale visiting Ling Gill and the Calf Holes I still had a couple of hours free before I needed to head home so decided to revisit one of my favourite spots in the Dales – Catrigg Force. Rather than just walking up to the waterfall and back down the same path from Stainforth I hastily decided on this short circular route. 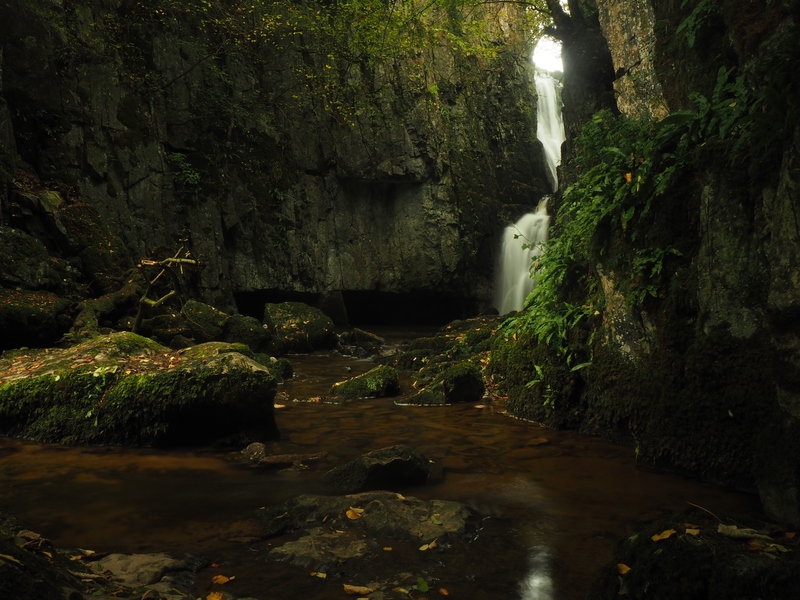 Situated approximately a mile away from Stainforth the waterfall is easy to reach by a simple walk up Goat Scar Lane. Throughout the steady climb there were nice retrospective views over Stainforth towards Smearsett Scar on the other side of the valley. From the top of Goat Scar Lane I took the path on the left signed ‘Catrigg Foss Only’ to drop down into the woods. Catrigg Force really is one of the most atmospheric places I’ve visited. To get the full effect of Catrigg Force I like to cross the stream to get up close to the dark pool that the lower fall drops into. This needs to be done carefully as the rocks underfoot are slippery but, in my mind, it is worth the risk and the potential for wet feet to do so. Having taken numerous photos from a variety of angles I reluctantly left the waterfall to retrace my steps to the top of Goat Scar Lane. Here I took a path, initially quite indistinct, heading north-east across reedy pastures. Just below Catrigg Barn I double backed on a slightly clearer path heading west across more pastures before dropping down alongside some autumnal woods above Tongue Gill. In one pasture I came across a variety of sheep including some Jacob sheep. One ewe had just a solitary horn – a sheepish unicorn if you will. At the foot of this pasture I passed through a gate and crossed a slab bridge over Tongue Gill. To complete the walk I followed a path briefly alongside Stainforth Beck before joining a pleasant track through some woods back into Stainforth.